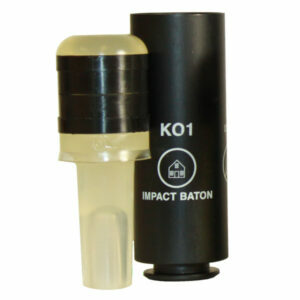 KO1 Impact Baton Round for 37mm Rifled. The KO1 is a direct fire modular impact round that is designed to be used in situations where kenetic energy is preferred for the imcapacitation of hostile and non compliant indviduals. Available in eigher standard or less energy, the KO1 kinetic energy baton Designated variation range from 20 to 100 meters. KO1 is reloadable and is available with smokeless or black powder propelling charges.